Dr. Jared Whitaker, UGA Cotton/Soybean Specialist has conducted a number of plant growth regulator (PGR) trials in cotton in Georgia. Below is updated information from 2014 and an article written by Dr. Whitaker from early this year. Research conducted in since 2010 has investigated the response of various varieties to two different PGR regimes (cotton which was not treated with PGR and cotton treated with mepiquat chloride three times (applied at initiation of squaring at 12 oz/A, at first bloom at 16 oz/A, and two weeks after first bloom at 16 oz/A)). Growth parameters, particularly end-season plant height, along with lint yield and fiber quality were used to assess the growth potential of a variety and document the impact a heavy PGR regime has on development and yield. Data collected each year is used to fit varieties into one of four particular classes of variety responses to PGRs. The first class contained varieties with the most vegetative growth potential, and would require PGR applications in almost all situations. The 2nd class contains varieties with similar vegetative growth potential of the 1st class, yet are more responsive to PGRs or may have earlier maturity. The 3rd class contains varieties in which could require PGR applications, however initiation of PGR applications prior to bloom is not generally necessary and could result in premature cutout, especially in dryland conditions. The 4th class contains varieties which may need no PGR applications or in almost all cases not applied prior to bloom. This grouping of varieties into classes was developed to simplify PGR decisions based on variety and help growers make more education decisions when planting varieties for the first time. 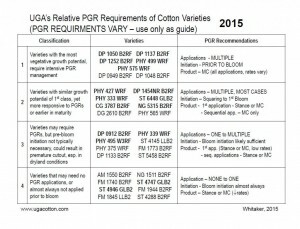 When a new variety is planted, PGR decisions could be based on its PGR classification due to being in the same class as a more familiar variety or because it is in a different class than a familiar variety. This system was also developed so that future investigations of PGR needs of new varieties can be more easily evaluated and quickly determined. 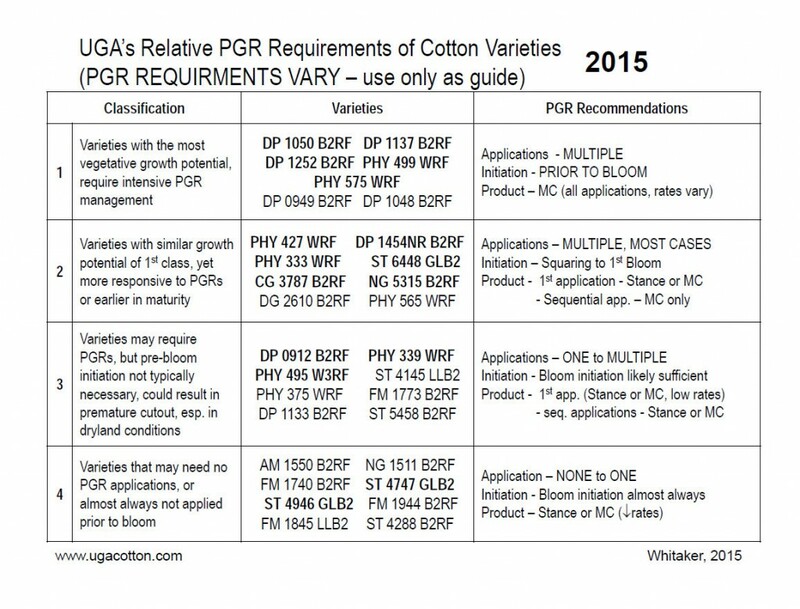 Below is the relative PGR classification chart which has been updated with information from 2014.